UTUADO, Puerto Rico — Carmen Rodríguez Santiago counts herself lucky to have any water service at home. But eight months after Hurricane Maria, the 52-year-old security guard said the faucets in her cream-and-pink-colored house still run dry every two to three days, and the water, when it returns, is flecked with sediment. Puerto Rican officials claim that water service on the U.S. island has been restored to more than 96 percent of customers as of June 6, but the report of progress masks underlying problems. Outside of cities, service has been slower to be reconnect. Flow is often intermittent and the water quality is uncertain. Throughout Puerto Rico, electrical outages and faulty generators mean pumps don’t consistently deliver water to residents’ homes. Throughout Puerto Rico, electrical outages and faulty generators mean pumps don’t consistently deliver water to residents’ homes and operations are disrupted at water treatment plants. Residents are cautioned to boil water for three minutes during the first three days after their water is restored or after an interruption to make sure it is safe to drink. “The drops in service represent generators failing or places where electricity was re-established and perhaps temporarily lost,” said Elí Díaz Atienza, executive president of the Puerto Rico Aqueduct and Sewer Authority (PRASA). The authority declined to share data regarding current water quality on the island. That is little comfort to rural residents like Rodríguez Santiago, who are left coping with limited access to clean water and fear the new hurricane season, which started this month. She said she broke out into a rash after she tried to shower with the faucet water. She does not wash dishes or bathe with it. She consumes only the water she hauls in from a government-run portable water station. “Now I get desperate thinking that a hurricane will come,” she said. Water safety has been a persistent issue for Puerto Rico, a problem exacerbated by the storm. Recovery has been fragmented. Hurricane Maria’s destruction knocked out water service to over half of the residents using the island’s utility provider, according to the Federal Emergency Management Agency. The authority provides water to more than 97 percent of the island. More than a third of sewage treatment plants were unable to function after the hurricane, according to the Environmental Protection Agency, resulting in raw sewage flowing into waterways residents used for drinking and bathing. And dozens of residents soon after the storm fell ill with leptospirosis, a serious bacterial infection that can occur from consuming or wading in contaminated water, according to health officials. Two of the three laboratories that had been testing water quality were rendered inoperable and are still under reconstruction. The water authority said most of the analyses are now done by subcontracted facilities. As Puerto Rican officials sought to restore water service, federal agencies also stepped in to help. The FEMA has provided more than 700 generators and diesel fuel to help power some water plants. And it has purchased 161 water storage units for remote areas of the island, which National Guard troops fill and maintain. FEMA also provided $70 million to the commonwealth’s troubled water utility in October. The federal government has taken legal action against PRASA at least four times since 2000 for violating the Clean Water Act, most recently in 2015, according to government press releases. A report last year from the EPA’s office of inspector general said PRASA postponed or terminated in 2015 nearly all of its active construction projects. It cites a letter from the authority sent in 2016 saying that it owed $140 million to contractors and suppliers. In all, the utility provider owed more than $5 billion in 2016, according to the report. The EPA stepped in, too, working with federal and Puerto Rican officials to test and repair drinking water systems not affiliated with PRASA. Today, all but two of the 114 drinking water treatment plants run by PRASA are in operation, although some are being powered by generators. All wastewater treatment plants are running, according to the EPA. Federal agencies also stepped up to assist with testing water quality. The results of that testing have not been released, according to the water authority. A 2017 report published by the Natural Resources Defense Council, an environmental advocacy group, found that Puerto Rico had the worst rate of drinking water violations in the United States. Most of the infractions — based on 2015 data collected by the EPA — involved failing to test the water’s safety. Nearly 7 in 10 residents received water from a source that violated federal health standards, according to the report. Nearly 7 in 10 residents received water from a source that violated federal health standards. PRASA pleaded guilty in 2006 to 15 felony counts of illegally discharging pollutants. One case involved directly dumping wastewater into a creek. In the 2015 settlement, the EPA accused the entity of improperly discharging pollutants again and operating collection systems with overflows that posed an “imminent and substantial” threat to residents who come in contact with the water due to possible contamination from raw sewage. The utility agreed to make major upgrades to its systems to remedy the problems. Although each settlement included a commitment from PRASA to improve its infrastructure, the island’s financial nosedive placed these plans on hold. “As part of its recovery work, EPA will continue to assess community drinking water needs and will work with federal partners to identify sources of funding or other help that can be brought to these communities,” said a federal agency spokesman. 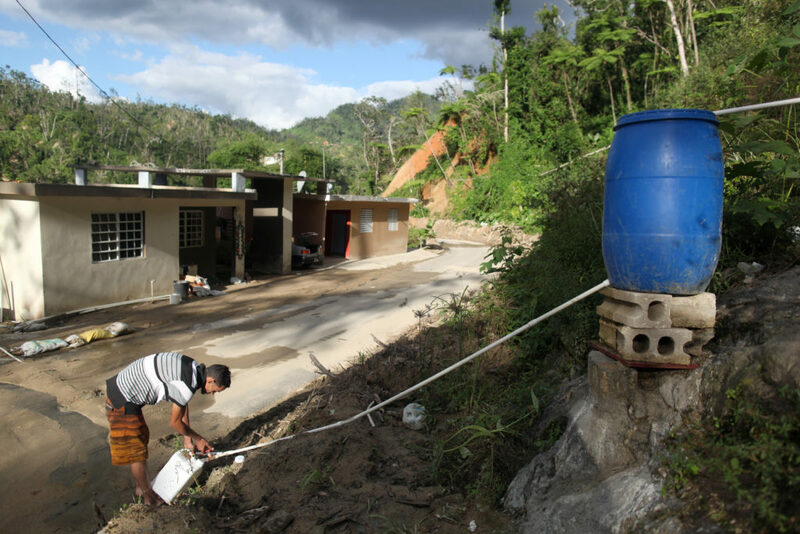 According to the office of municipal emergency management services in Utuado, residential water service has been restored to most of the municipality. However, electrical blackouts at times knock out the pumps needed to filter and distribute the water. 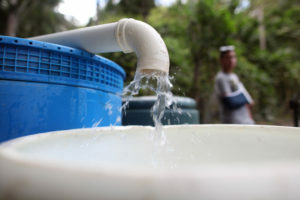 “The main problem is that there’s no electricity where the water is processed,” said Ángel Medina, a supervisor in the office. Medina said he does not know when PRASA will fully restore services to Utuado. For those living without water in their homes, “we are telling them to stay calm,” he said. Elba Negron Carreras is one of those residents. For the past eight months, she has walked a half-hour with her two children to a local water station maintained by the military to fill up plastic milk jugs for the family’s showers. Or she has drawn water from a local aquifer that needed to be purified before drinking, using a filter given to her by a local health clinic. Negron Carreras, 48, started receiving intermittent water service in her home in early May, she said in a phone interview. She follows PRASA’s guidelines and boils the water for three minutes before using it to drink and cook. Her daughter is elated to take a shower without struggling with plastic containers. For now, Negron Carreras said, the improvements are enough.